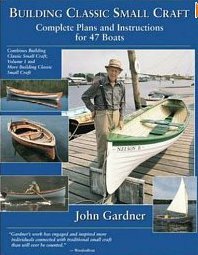 I've listed a whole bunch of wooden boat building books in my Amazon book store. Not that I'm interested in traditional wooden boat building all that much. Traditional wooden boats weigh too much. You either need storage on the water or a boat trailer and trailer storage to own one of these boats. But traditional wooden boats were powered by human power or wind and therefore had to be efficient and will potentially lend themselves to skin on frame construction by which almost any small boat can be made to come in under 100 pounds. So, traditional wooden boat designs lend themselves to building in skin on frame. There are certain limitations which you have to overcome or simply avoid, but since wooden boats were built by bending wood over a framework, the shapes of wooden boats are possible to emulate in sof. You won't find any curves on a traditional wooden boat that can't be copied in skin. In addition to giving you plans of wooden boats, these wooden boat books also give you advice on what sort of environments these boats might be good for. Maybe I'm a little too optimistic on the topic of adapting wooden boat designs to skin on frame, having only built three sof boats that were based on wooden originals and two of them boats with bark for skin instead of wooden planking, but still, I think the idea is a good one. Only one major caveat needs to be mentioned. Being lighter, an sof boat will sit higher in the water and have less momentum than its wooden skinned original, something you might have to correct with ballast. But heck, as Pete Culler once wrote, experience begins when you start building. Glad you have been telling us about the store. My adblock program automatically blocks such things. Wolfgang - Given your interests, you might want to google "tristan da cunha" and "longboat" for not yet dead SOF longboats in one of the most remote maritime communities in the world. Thanks for pointing out that adblock blocks the peripheral stuff I hang on the blog. The Amazon store seemed like a handy way to create a bibliography of books that relate to my boating interests. I also tinker with these add-ons just to see how they work. re the tristan da cunha boats, I think I saw something about them a long time ago in an old National Geographic mag. Descendants of the Bligh mutiny I think. Will have to check it out again.